This is the primary way most organization promote their program. We have a fairly large town with 3 teams. We are competing with 2 other organizations for the kids in our town. We will put out several lawn signs in high traffic areas. We will put as many lawn signs out as humanly possible. We will also purchase nice custom signs. Our signs are very dominate and very eye popping. The fact of the matter is that everyone is on social media platforms like- Facebook, Twitter, and Instagram. You can use Facebook as your online bulletin board. There are great advertising opportunities on Facebook as well. Utilizing platforms like Twitter and Instagram can also bring great exposure to your organization. You can do real time game tweets and pictures. You can search twitter and Instagram (hash tags) for people talking about your organization. 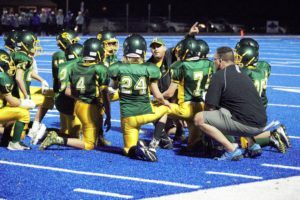 You can also connect with players and parents that are already apart of the organization. Create a YouTube account and create some hype videos. Create some cool hype videos with game and practice highlights. Cool videos will create excitement and should be feature on your team’s website. Having a discounted early bird registration special is a great incentive for parents to commit and sign up for football. We have two early bird registration specials. We have one in March and one in April. Offering a discounted registration really helps families that are on a tight budget. You do not want to deter kids from playing because of financial reasons. We market our early bird registration dates in the local schools, local paper, at our banquet, on our site, and on our social platforms. Our league requires 4 types of certifications for all coaches. Rutgers Safety Certification, Pop Warner Certification, Heads Up USA Football Certification, and Coaching Youth Football the Pop Warner Way Certification. It is a good idea to mention that all coaches are USA Football Heads Up Certified (assuming you are). This should be displayed on your team’s website and even on lawn signs. This will show parents that your organization is focused on safety. We will pay for some newspaper space before the season. We will promote our early bird registration in the local newspaper. We will also pay to be featured in the local paper a month or so before the season starts. Luckily for us it doesn’t cost an arm and a leg to get into our local paper. We will create flyers and give them to all the local schools. The school is able to distribute them to the kids. We also create flyers for local grocery store bulletin boards. We offer online registration. This is very convenient for the parents. It allows parents to register their children from the comfort of their home. They do not have to get up Saturday or Sunday morning to go to an in person registration. We also honor our early bird prices through online registration. Come June we will have a free speed and agility clinic that is open to all the children in our township. This is a great way for kids on the fence to get a feel for what football is all about. We also have a registration table at the camp. This always gets us additional sign ups. We will have all our head coaches and assistant coaches operate the camp. Basically what we do is we set up drill stations. Each station is a different football relevant speed & agility drill. We break the kids into groups by age, and then we just rotate the kids around the designated stations. This is really easy to execute and if you make it upbeat and fun the kids will love it. You can implement competitive races and things of that sort as well. We will have a free football camp available to all the children in our town. Like our speed camp, this football camp is a great way to generate excitement, meet parents, and drive new sign ups. This camp is a two day camp. We will do offense the first day and defense the second day. We will break the kids up by age and each coach will have a position station. This camp will be operated the same way as the speed camp, just with different drills. We will have a 3 point stance station, throwing station, catching/route running, run blocking and pass blocking station. Defensively, we will have a block shedding station, and a heads up tackling progression station (technique, form fit, then tackling dummies). This is a very important camp for us because the season will be less than a month away. The goal of this free football camp is to get kids registered, bring excitement for the season, develop fundamental skills and meet/engage with parents. After each registration I make sure I call whoever registered for my team and introduce myself. I will also let them know that there will be rewards given to parents/kids that refer new kids to the organization. Incentives can include gift cards, football tickets, discounted registration (refer new players and get a discount), and free jerseys. We are sometimes able to get Rutgers University football tickets donated or discounted. We will give away the tickets to the parent or player that refers the most people to organization. Giving away football tickets and gift cards seem to work the best. If you had teams that did well make sure you make that known. Put on your team’s website: “Congratulations to our Jr Peewee Team for going undefeated”. Winning will attract people to the organization. Sometimes the best way to drive new sign ups is to win games. All is well when you are winning games. But be careful you don’t brag to much. You do not want to over brag or seem too arrogant either. Do not forget that Youth Football is about the kids, not so much about winning every game. If you have the budget, kids that sign up should get a shirt. Kids will love cool shirts promoting their team. Giving these kids shirts will give them a sense of pride. When kids are wearing their shirts they are walking billboards. If shirts aren’t possible, car magnets are an excellent, cheaper alternative.